Don’t know much about it…a quick Googling seems to date this magnet to the mid 1990s. 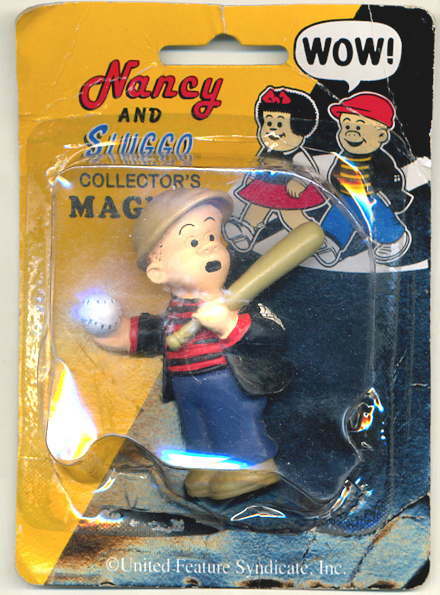 It looks older than that to me, but that may just be because Sluggo is eternally a creature of the ’40s or ’50s. I have another eBay-obtained Sluggo magnet coming in the mail, and there may be more yet to come. Watch this space for all the latest Sluggo magnet news! DON’T TAKE YOUR EYES FROM THIS SPACE. EVER. CO2 Comics has a neat archival comics project in the works…not of actual comics, but of the 1980s and 1990s zine Comics Interview . The 11-volume project is titled David Anthony Kraft’s COMICS INTERVIEW: The Complete Collection , with volume one, currently in release, coming in at a whopping 680 pages. Comics Interview was a fine mag, each issue stuffed with interviews with comic creators, publishers, showbiz celebrities, and even the occasional fan. Some of the interviews included in this debut book include Steve Gerber, Keith Giffen, Berke Breathed, Joe Kubert, Walt Simonson, Don Rosa, Matt Wagner…man, there’s a lot of them. Just go to the site and click on the animated book cover-thingie and you’ll see the contents yourself. I have to admit it never occurred to me that those old Comics Interview zines should be collected into a more permanent form, but it sure seems like a good idea and I’m glad its being done, rescuing all these interviews from obscurity. Maybe this’ll lead to more zines being collected…c’mon, complete Comic Reader ! In the mood for something…spooky? Then treat yourself to an uncanny tale of mind-bending horror, courtesy El Gorgo! Bully, the Little Stuffed Bull, finds a thread and follows the heck out of it! What terrible secret unites the Fantastic Four with one of the most beloved films series of all time? And in Halloween-ish webcomic news… Cool Jerk ‘s Paul Horn joins Kevin Church in a weeklong zombie-riffic adventure in The Rack . People live…people die, and The Rack will never be the same! Comics Interview used to do collections of its sold out issues themselves as well and I’m very fond of e.g. the “Cosmic Crossovers” trade. If only Amazing Heroes would do the same; nothing as fun as reading old fanzines. Please realize that the Sluggo magnets will not stick to your refrigerator or other metal object. That’s not the type of magnetism at work. It’s SHEER ANIMAL MAGNETISM, baby! LOVE the old Comic Reader, just bought a lot off Ebay myself not too long ago. I even had a letter printed once, in Don Rosa’s “Comic Book Hall of Fame” Column. Maybe a feature that needs to come back, hint hint, Mr. Sterling? anyone remember the 80s Comic Scene? It turned me on to so many great titles. Is it EVEN a regular briefcase inside? When I was looking at the entry with a customer last night, neither of us could find any indication that the damned thing actually OPENED. I mean, as an actual briefcase, it’s moderately cool (if entirely unprofessional and waaaaaay too pricey and easily scuffed for casual use). If it’s just a prop of a PRETEND briefcase? Here’s a review showing the Iron Man suitcase opened up. The Comics interview project is great, but it comes at a time when I just need one final issue of the series. AAARRRGHHH!